Looking for a gift with peanuts, nuts or snack mixes? FERIDIES offers several gift creations in a variety of price ranges for any occasion. 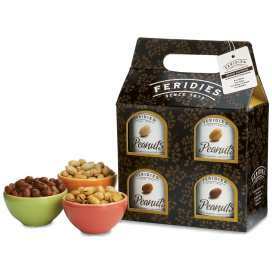 We at FERIDIES® have created a variety of assortments of our nut and snack mixes that make perfect gifts for any occasion. 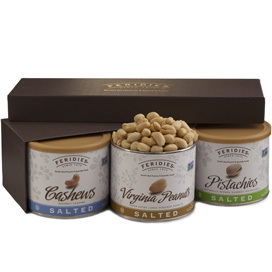 These peanut gifts and nut gift baskets will satisfy every palate and fit any budget. We believe you will be pleased with the quality and value of our gift creations, and will be delighted with the reaction they receive. 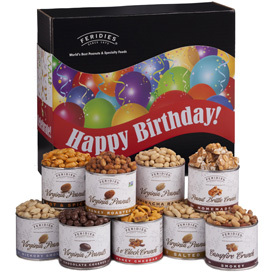 Our nut gifts offer a full range of tasty assortments. 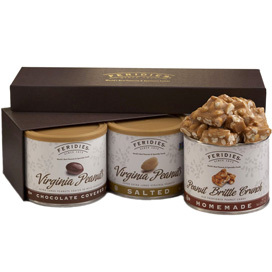 We offer peanut gift collections and gift baskets that feature our excellent super large Virginia peanuts, roasted lightly in peanut oil in small batches, and either lightly salted or given a touch of sweetness (honey roasted), or savory (hickory smoked) or a heavenly joining of crunchy peanuts and luscious chocolate (milk or dark). We also have created a number of snack mixes that blend contrasting flavors and textures. Starting with our Virginia peanuts, we add ingredients like jumbo whole cashews, roasted pepper and garlic-flavored sesame sticks, salted corn chips, mustard pretzel sticks and mango-flavored habanero seasoning, creating unique snack mixes that can be savory, spicy, or both. Some of our gift packs come in clean, unadorned boxes that display the individual items nicely. 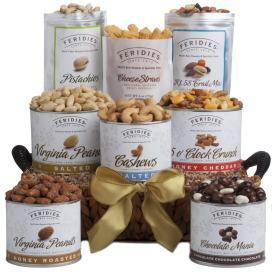 These (such as the Snack Medley Mix and the Peanut Sampler) make wonderful gifts whether gift-wrapped or not. Most of our gift assortments, however, come packaged in festive boxes - no wrapping necessary. We have assortments designed for Christmas (such as the Reindeer and Santa Claus Snack Bags); for birthdays, thank you, sympathy and congratulations; and for sports fans (such as the Football, Soccer and Golf Snack Boxes). Just click on "Occasion" under "Refine By" to narrow your search and find the right gift for the occasion. If you don't find the right assortment, click on "Create My Own Gift" under the "Gifts" category and select the box, message and items you want for a truly thoughtful gift. For our friends with special dietary considerations, you can see our Kosher, Dairy Kosher and Non-GMO Project Verified offerings by clicking on "Nutrition" under "Refine By" and selecting a category. Our goal at FERIDIES® is to ensure your shopping experience results in you finding the right gift, at the right price, with ease.